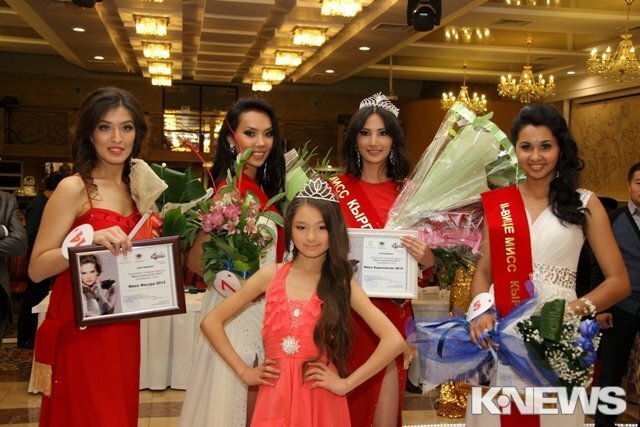 Kyrgyzstan crowned a brand new queen last night. Zhibek Nukeeva (18) defeated 20 other delegates to be named Miss Kyrgyzstan 2013. She will represent her country at the 2013 Miss World Pageant in Indonesia later this year. Meerim Erkinbaev was named the first runner-up and she will be her country's first representative at the Miss International Pageant. The second runner-up was Mariam Esenova who might compete at Miss Earth 2013. The new Miss Kyrgyzstan (center) with her first runner-up (2nd from L) who will compete at Miss International 2013 and the second runner-up (Far Right) who might represent her country at Miss Earth 2013. The winner is gorgeous. She could do well at Miss World. The runner-up is really pretty too. Good choices.